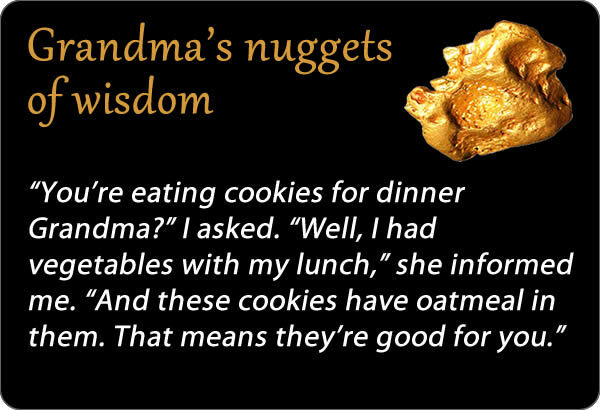 To tell you the truth, I use this logic myself to justify my own frequent nibbling on oatmeal treats. I am aware I am just fooling myself, though. No-bake cookies have oatmeal too! As well as sugar, butter, etc. I suppose we’re all guilty of this — it was just the “don’t you know anything” tone that suggested to me Grandma does NOT know she’s fooling herself. I figure if she wants cookies for dinner, let her have them. If I make it to 88 I’m going to eat whatever I want too! I mean, of all the cookies she could have eaten, oatmeal probably is the healthiest, so there’s that! Haha yeah that would backfire on you real fast!